Polish rabbi; born in Wilna about 1578; died at Cracow Aug. 16, 1648. In his boyhood he journeyed to Przemysl, Galicia, to study the Talmud under Rabbi Samuel ben Phoebus of Cracow. 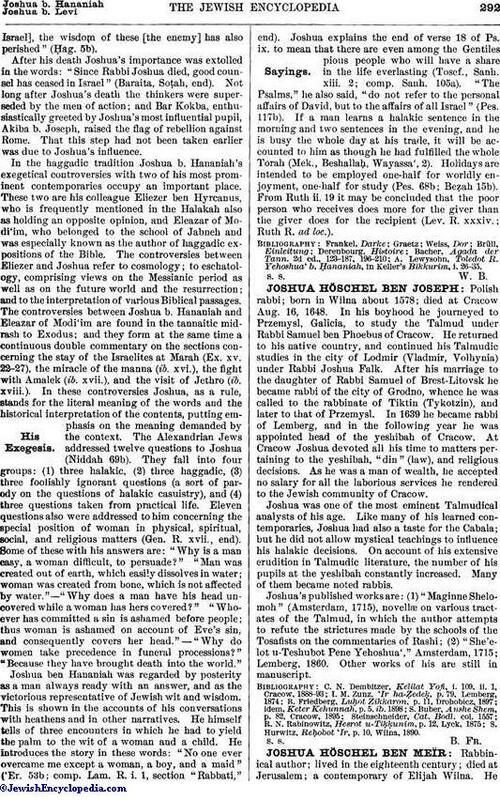 He returned to his native country, and continued his Talmudic studies in the city of Lodmir (Vladmir, Volhynia) under Rabbi Joshua Falk. After his marriage to the daughter of Rabbi Samuel of Brest-Litovsk he became rabbi of the city of Grodno, whence he was called to the rabbinate of Tiktin (Tykotzin), and later to that of Przemysl. In 1639 he became rabbi of Lemberg, and in the following year he was appointed head of the yeshibah of Cracow. At Cracow Joshua devoted all his time to matters pertaining to the yeshibah, "din" (law), and religious decisions. As he was a man of wealth, he accepted no salary for all the laborious services he rendered to the Jewish community of Cracow. S. Hurwitz, Reḥobot 'Ir, p. 10, Wilna, 1890.